Uncertainties keeping would-be sellers on the sideline. Rick Egan | The Salt Lake Tribune Real estate agent, Mark Numbers, right, shows a home to Jami and Scott Holdaway, in Salt Lake City with Wednesday, February 13, 2013. 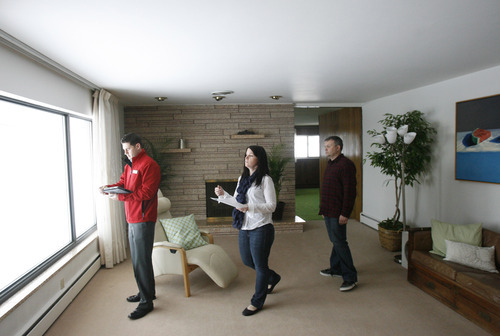 Rick Egan | The Salt Lake Tribune Real estate agent, Mark Numbers, left, shows a home to Jami and Scott Holdaway, in Salt Lake City with Wednesday, February 13, 2013. 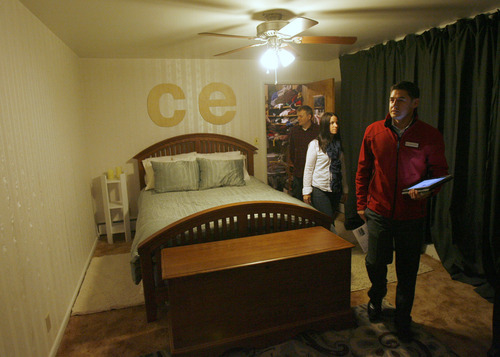 Rick Egan | The Salt Lake Tribune Real estate agent, Mark Numbers, left, shows a home to Jami and Scott Holdaway, in Salt Lake City with Wednesday, February 13, 2013. Rick Egan | The Salt Lake Tribune Jami and Scott Holdaway tour a home in Salt Lake City with real estate agent, Mark Numbers, Wednesday, February 13, 2013. Rick Egan | The Salt Lake Tribune Scott and Jami Holdaway tour a home in Salt Lake City with real estate agent, Mark Numbers, Wednesday, February 13, 2013. The number of homes along the Wasatch Front listed for sale was at a 15-year low at the end of 2012, even as prices rose steadily through most of the year and sales gained ground. The scarcity of homes on the market underlines the severity of the housing market&apos;s collapse in Weber, Davis, Salt Lake and Utah counties, as well as many Utahns&apos; uncertainty about the pace of the recovery, real estate experts say. Listings peaked in the fourth quarter of 2007 at 14,683 homes, according to the Salt Lake Board of Realtors, which cited figures compiled by the Wasatch Front Regional Multiple Listing Service. By the end of last year, that number, which includes foreclosures and short sales, had been cut to 7,229  the lowest count since the fourth quarter of 1997, when 5,767 homes were on the market. Myriad reasons are offered why sellers are holding back, even as demand for homes rises. Some say the 6 percent gain in the median price of a single-family home in Salt Lake County last year wasn&apos;t enough to offset the sharpest decline in values since World War II. 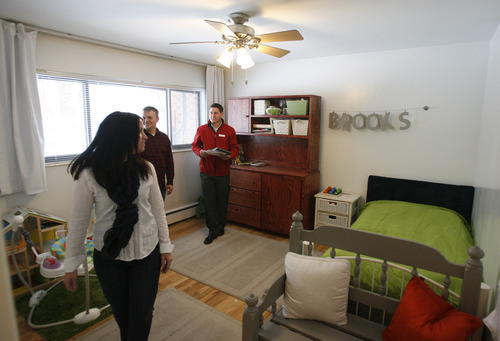 "Prices dropped by 25 percent in Salt Lake County. So a [6 percent increase] is good news. But it&apos;s not enough to motivate me to put my house on the market right now," said Jim Wood, director of the University of Utah&apos;s Bureau of Economic and Business Research. The economist owns a pair of homes and wants to sell one. Because he expects prices to rise 10 percent to 12 percent this year, he will wait awhile before listing it with an agent. "I&apos;ll probably sell it this summer. But I know I could do better if I waited another year," he said. Like other experts, Wood believes the number of listings probably won&apos;t fall further in 2013. Still, many potential sellers are more likely than not to stay on the sidelines until values rise further, he said. 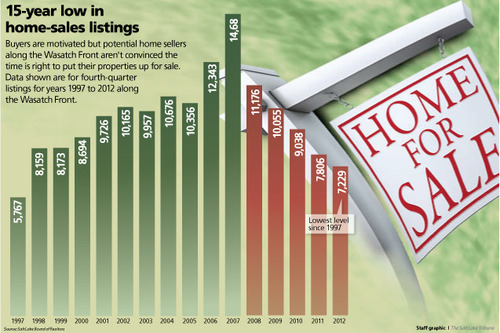 Home sales in Salt Lake County jumped 15 percent last year, to 10,870 units from 9,452 in 2011. The gain was on top of a double-digit rise over 2010. Dave Frederickson, president of the Board of of Realtors, said worries that record low interest rates might rise soon is driving many buyers to snap up properties on the market  so much so that bidding wars have erupted over well-priced homes. And that&apos;s pulled the inventory well under numbers that were typical before the housing bubble formed, he said. "Interest rates have almost caused a feeding frenzy. It&apos;s not allowing us to build back up supply. I don&apos;t know if a lot of potential sellers out there even know [the housing market] has come back," Frederickson said. "The buyers are catching on to that quicker than the sellers are." Realtor Adam Kirkham thinks that with prices down 25 percent since 2007, a lot of would-be sellers who bought homes at the height of the market may not have enough equity to sell them at an acceptable profit. Worse, some people might even be upside-down in their mortgages  owing more than their homes are worth. So they won&apos;t  or can&apos;t  put their homes up for sale, he said. "If you don&apos;t have equity, you don&apos;t have the flexibility of selling out of choice. It&apos;s more of a forced sell." What&apos;s a buyer to do? Even though real estate agents may appear to have self-serving motives for advising people to act if they see a suitable home for sale, their certainty that the housing market is on its way back is backed up by experts beyond the Wasatch Front. Earlier this month, Trulia, a real estate website, put Salt Lake City on a list with San Francisco, Seattle, Denver and San Jose, Calif., as the best examples of booming markets right now. "We have created a seller&apos;s market that is as strong a seller&apos;s market as I&apos;ve seen in the eight or nine years I&apos;ve been in the business," Kirkham said. "My advice to buyers is, if they have found a property, not to hesitate." • Make the house say "buy me"